During a recent trip to Colombia I visited Medellin, the second largest city in the country, which is situated in a valley surrounded by mountains. 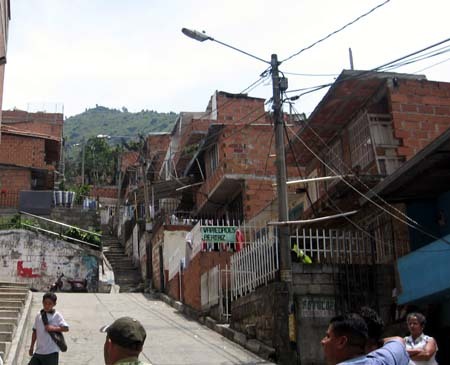 Like many succesful South American cities the outskirts are saturated with shanty towns, or "comunas", built on the mountain sides. The conditions in these extremely poor communities are very bad with little or no running water, minimal transport links and very few amenities. In Medellin however, the city has begun, and is continuing, a project to build cable car transport links to the tops of these villages. This has sprung a well of renewal, investment, tourism and employment. It´s very exciting to see the city changing before your eyes. Upon exploring one of the comunas, the one with the first of the new Metro Cables, I noticed children playing on some steps. I realised there is no flat space to play a good game of footy. It´s too steep to risk playing with a ball that if released will roll all the way - over a mile or two - to the bottom of the mountain. The nearest place to play is a cable car (and a few stops on the Metro) away, and this is the only comuna so far to be blessed with a Metro Cable. The kids need a game to play. Now, I know that children´s innovation and initiative can be boundless when the goal is to have fun, but I thought we could lend a hand at providing a means for them to play some sports in their streets. Favela Football is simple really. The ´ball´ is a rubber cube, the which won´t roll off into the distance. Teams play an equal amount of time both ways, uphill and downhill, and possibly there is only one goalie (at the bottom), which should balance the difficulty of scoring uphill against down. Goal posts are still made of bags and coats. As regards throwing money at a ball that doesn't roll downhill, you could probably come up with something that would stay on a constant vector, but how would you then not kill the effect of spinning the ball? Jutta, that would indeed be quite an engineering feat but, as you say, quite costly. As to where the money for the renewal comes from, I couldn´t possibly speculate. However DrCurry, I assume you refer to Colombia´s infamous drugs trade - though I can´t fathom why drug money would be poured into comuna regeneration projects. To launder money? But how would they get it back? 2.) Would make a good stool to sit on, perhaps in classrooms or just after a game. It comes from the realisation that, left to their own devices, the inhabitants of these deprived neighborhoods will forever be stuck in a cycle of poverty. This poverty, unfortunately and inevitably, engenders violence and is the main obstacle to societal progress. In other words, the business case for providing social services stacks up (and I think it is also the socially responsible thing to do). As to where the money really comes from, Medellin is an important manufacturing and commerce centre and the central and local government tax take is quite substantial. How did you end up in Medellin [theleopard]? Interesting that the less desireable real estate is on the elevated land. Not really [Texticle]. The valley is very deep and you get very beautiful views from just about anywhere. Playing uphill/downhill seems like a bad idea. Even though each team plays each direction, might you end up playing each half in just one end of the field, like you would on a very windy day on a level field? Playing across the slope would probably be better, still changing ends. Teams could devise interesting uphill/downhill passing combinations and shooting angles as well. Unfortunately [noexit], the roads wide enough to play a decent game of footy are the ones climbing straight up the mountainside but they´re not wide enough to play across, being some 5-7 metres wide. The paths and alleys that sprawl from them are too narrow and winding in general to play there. I like the uphill/downhill shooting combinations though. Sorry [theleopard], I've been away from the 'bakery for a few weeks. If you want, let's take the chat to email. My profile page has my address.